over the weekend i woke up thinking about my great aunt. every year for thanksgiving she always made the best stuffing. this stuffing seriously could have won an award for how well it performed as a side dish next to the turkey, sweet potatoes, and cranberry relish. i could make a meal out of just this stuffing. it's embarrassing, but seriously, it is that good. 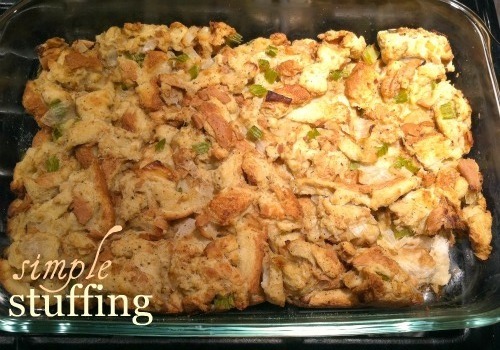 for the last few years, my mom and i have attempted to recreate my great aunt's stuffing recipe. we never get it exactly the same, but we have come pretty darn close. alright, now let's be honest. i fully realize that thanksgiving was only three months ago, but i just couldn't bare waiting until november to have stuffing again. so, i made stuffing on sunday night, and it was a lovely side dish next to pork chops and broccoli. go ahead. make yourself some stuffing as a side dish in february . . . you know you want to. notice that there is a section missing from the bottom corner? that i forgot to take a picture first! preheat the oven to 350 degrees F. finely chop the onion and the celery. in a medium saucepan, over medium heat, saute the onion and the celery in butter. set aside. in a large bowl, whisk together the eggs, chicken broth, sage, garlic powder, and pepper. 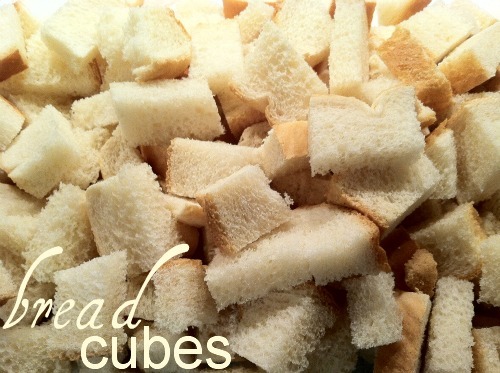 cut the bread into cubes and add to the egg mixture. gently toss the bread, making sure that bread is evenly coated. 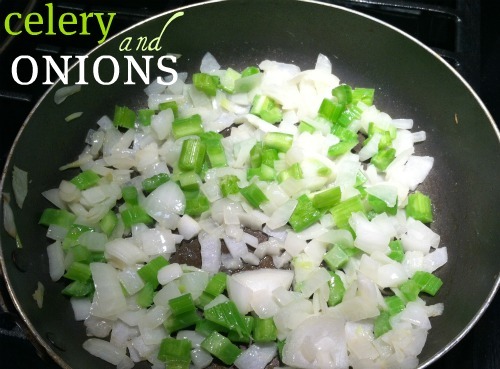 mix in the onion and celery. press the mixture into a lightly buttered 9 inch by 13 inch glass baking dish. bake for 1 hour, or until the top is brown. okay, you seriously need to come and cook for me from now on. scrumptious! !